The Flats at Grandview Commons is a new affordable housing community that will bring high-quality, affordable homes for families. Madison, Wis. (November 3, 2017) – Community leaders, local residents and development partners came together today to celebrate the start of construction for The Flats at Grandview Commons, a new 94-unit affordable housing community designed for working families in the region. Developed by Royal Capital Group, the new community is being built on a vacant lot located in the Grandview Commons neighborhood on the east side of Madison, south of Milwaukee Street and east of Interstate 90, just a few miles from downtown. 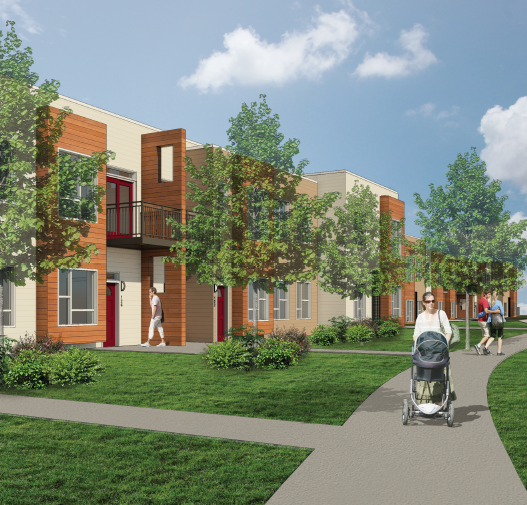 The Flats at Grandview Commons will include six two-story structures with 28 two-bedroom and 66 three-bedroom units. On-site amenities for residents will include a community room with a library, computer lab, meeting space, playground, and private garages. On-site family offerings and activities for residents will include programs in health and nutrition, after school programming with local universities, and family finances. Project funding and key development partners include the Building Blocks, Cinnaire, Minnesota Equity Fund (MEF), UnitedHealthcare and the Wisconsin Housing & Economic Development Authority (WHEDA). WHEDA is a primary partner, providing $11 million in both construction and permanent financing for the new community and approved the use of Low Income Housing Tax Credits for construction. UnitedHealthcare is the largest private-sector investor, providing $5.4 million in equity funding through a partnership with Cinnaire and its strategic partner Minnesota Equity Fund. UnitedHealthcare, which employs 7,300 people in Wisconsin and serves the health care needs of more than 1.6 million residents in the state, has partnered with Cinnaire and MEF to invest over $85 million to help build 13 new communities in Wisconsin and the Great Lakes Region, providing nearly 670 new, affordable homes with support services for individuals and families. The Flats at Grandview Commons is expected to open in the fall of 2018. Engberg Anderson serves as the architects, Horizon Construction will serve as General Contractor, and ACC Management Group will manage the property and on-site support services.